Since starting the book I have made friends with Maseca aka masa harina, a special lime-treated corn flour. Masa harina is the building block for huaraches, pupusas, and tamales (not to mention a key ingredient in the awesome jalapeno cheddar corn cakes from Big D's Grub Truck). To be entirely honest, I actually had no idea that there were beans inside the huaraches until I read the recipe sent to me by Fernando Martinez, owner of the Country Boys truck. Getting the Maseca dough to just the right consistency so that it's soft enough to be workable, but strong enough to hold the beans was a challenge. I was comforted by the fact that when Fernando was interviewed by Nona Brooklyn when describing their early days making huaraches he said: "Out of every five huaraches, two good ones came out and three bads. And little by little we got better, and now we can do the work quickly." With each batch my technique seems to improve. 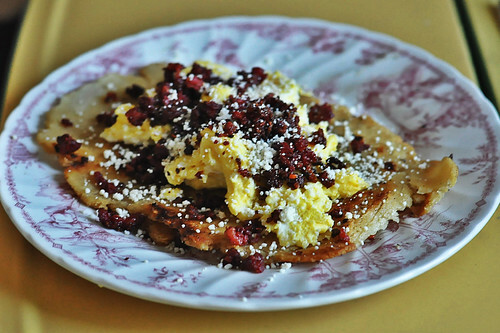 Inspiration struck at breakfast the other day and I decided to try egg, cheese and chorizo huaraches. Does it surprise you that these would be ridiculously delicious? And my huaraches are getting better and better with each batch. I can't wait to give them another try soon!